Dera Sacha Sauda supports and promotes cleanliness and hygiene in every possible way. It believes in cleaning civic areas and maintaining the cleanliness. And thus, this campaign encompasses villages, towns, cities and metros. These drives are carried our periodically with aim aim to prevent diseases by following public health measures along with promoting public awareness towards cleanliness. Also, garbage is reduced and parasites and flies are De-weeded and reduced in number. In the light of present day diseases like dengue, malaria and plague epidemics, this has become a need of the hour from a public health perspective. If we talk about the metro Delhi for instance, it has been inexorably weighed down by its increasing population. The steady influx of migrants, the noise and the pollution, the water and sanitation situation along with a sub-optimal disposal of urban waste, has created squalor in the midst of abundance. As passengers chug into the city by train, troublesome sights, sounds and smells assail one’s nostrils. While there is no doubt that we are scrupulously clean with regard to our personal hygiene, our penchant for open defecation, urination, spitting and littering is well known. To counteract the increasing squalor, pollution and diseases, Revered Saint Gurmeet Ram Rahim Singh Ji Insan gave a rousing call to clean Delhi, as that is the world’s window to India, being the national capital. Thus, started the series of Mega Cleanliness Earth Campaigns by Dera Sacha Sauda across the globe. 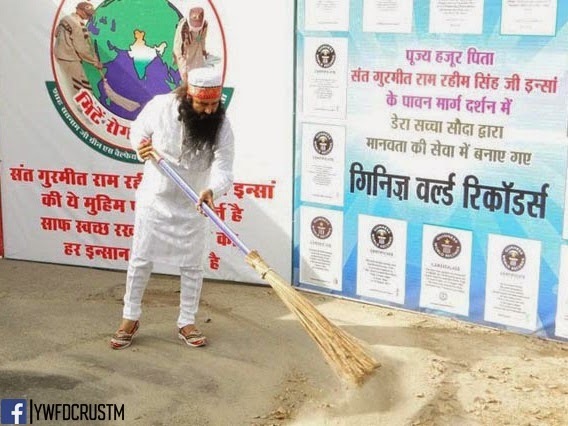 Till date (25th Oct 2014), 27 Mega Cleanliness Campaigns have been conducted in several states of India under the holy auspices of Revered Guru Ji and millions of citizens have pledged to maintain cleanliness in their surroundings by signing pledge forms. Dera Sacha Sauda volunteers residing in foreign countries are also no more far behind to carry forward this noble cause in their respective countries . Click Here To See Photos or Read Articles about all the Cleanliness Earth Campaign done till now.